It took us a bit of time to get through our college years, but boy! was it ever a wonderful journey! Brad graduated with a degree in Jazz Music Composition then spent the summer SCUBA diving. In Utah. I know – hard to wrap your mind around that, isn’t it … diving in Utah. He got certification upon certification and by the end of the summer was a legit, PADI Dive Instructor. Trevor had just turned 5 and Halloween night after trick-or-treating we gathered as a family of 3 and made the decision to accept the job offer on Guam. I was due to deliver our 2nd child in December and we committed to be in Guam the first of January. I’m a pretty protective mom, so Brooke was 10 months old before I agreed to leave the kids with a sitter. This first date with Brad in nearly a year was on a warm, tropical night – on board the Sea Odyssey. Brad had worked for the company as a dive guide and Japanese-speaking dive instructor and was excited to take me out for the company dive party. Problem was – I didn’t dive. I never understood the draw. I stuck on a mask and regulator at a lake in Utah once, poked my head in and saw pretty much nothing. So there was never a burning desire to dive for me. But we did spend a few afternoons as a family on the beach once we were on Guam and I donned a mask and snorkel and saw that there really is a whole new world under the sea. It was gorgeous. Yes! I could learn to love visits under the water! So this night out, Brad asked me if I would please dive with him. Everyone would be diving, and it would be good for him with the company if I dove too. 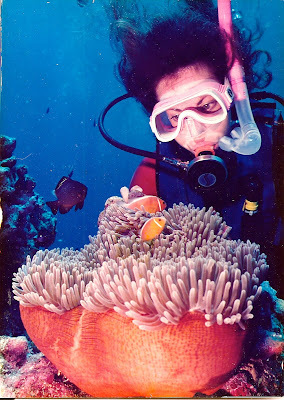 Plus, he had been trying to talk me into diving since we arrived in the tropics. It was a typically warm, muggy night – made comfortable by the ocean breeze. Everyone but the captain was in the water and Brad was helping me climb into the gear. Strapping my tank onto the BC, Brad went over the steps again: “Use your right hand to cover your mask and regulator, and cover your weight belt with your left hand. I’ve checked your tank and the air is turned all the way on. Now when you do the giant stride off the boat, look straight ahead and really make it a giant stride. It’s safer that way, I’ll be right there. You won’t go too far down before floating back up to the top. I’ll be right there – and we’ll go down together.” I understood what he was saying, but it was dark. And deep. And did I say it was dark? One big splash and Brad was in the water – I stood alone on the deck, just 3 feet above the surface. I knew I couldn’t make Brad beg to get me to jump in – the captain was the owner of the company and it just wouldn’t look good. So I scooched to the edge of the deck, focused straight ahead on nothing, covered my mask and regulator with my right hand and my weight belt with my left, thought “Brad wouldn’t ask me to do anything that would make me die”, then stretched my leg straight out in a perfect giant stride, held my breath, and plunged. Deep. Well, it felt deep. I think I even closed my eyes. So I wasn’t sure that I had even surfaced when I heard Brad trying to get my attention. “I’m going to let the air out of your BC and we’ll go down together. Keep your eyes on me as we go down and give me the ok sign whenever I ask you for it. If you absolutely have to come up, don’t shoot to the top – just give me the signal and we’ll go up. Ready?” I don’t remember telling him I was ready, but I do remember breathing out of my regulator and feeling relief that he really did turn on the air. Down we went, and I focused on Brad’s eyes and popping my ears and tried to ignore the vast blackness around me. 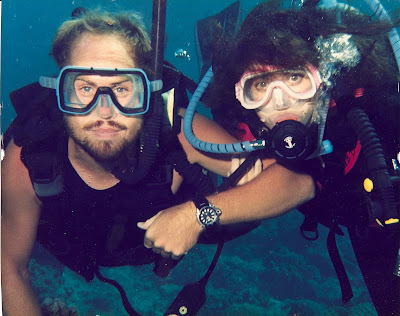 Brad held my hand through the entire dive – his other hand holding the flashlight. He would aim the flashlight in different directions, but I just focused on Brad. We were only minutes into the dive when I motioned for us to go up. Wordlessly Brad communicated that I was ok and that we should continue. I kept thinking that as long as Brad had my hand, I was fine. He would keep me safe. Eventually I was so insistent that Brad took me to the surface. Brad has always been so in tune with directions and distance. He knew if we surfaced there we would have quite a swim back to the boat, but he acquiesced anyway. When we broke through the surface he inflated my BC and had me lie on my back. As Brad towed me back to the boat he talked about all the magnificent things “we” saw. Fish of all kinds, eels, shellfish that only come out at night, and on and on. I wondered where he had been! I didn’t see a thing – only Brad’s eyes and the blackness all around me. I had plunged into the dark. And with that plunge I broke through my fears: My fear of leaving the kids, my fear of darkness, my fear of being blanketed in water. And what a blessing that plunge into the darkness was! Just 2 days later I left the kids with a friend and spent the day on the water with Brad and diving tourists. I explored the underwater world during the day, in water so clear that I could see for miles. At 70 or 80 feet below the surface I looked up and it was so clear it looked like I could reach up and touch the bottom of the boat. An entire new world was opened up for me. Through our years on Guam I found shells, swam with sharks, explored coral, fed eels. 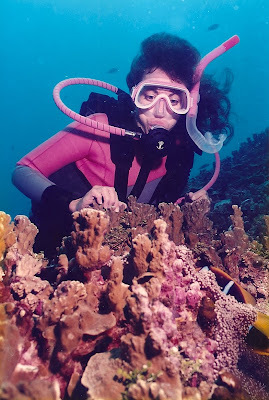 Diving became my passion. I learned that the beautiful creation we call the Earth was much more than rainforests and mountains. Besides the beauty under the ocean, the weightlessness, the ease of movement, the freedom in water – those were entirely new sensations that have made my life more complete. I would never have known that peaceful excitement had I not taken my original deep, dark plunge. "Conquering any difficulty always gives one a secret joy, for it means pushing back a boundary-line and adding to one's liberty." I can't believe that your first dive was in the dark - amazing trust! I am terrfied of the water, but these are amazing pictures!!! What a great story!!! Love those pictures!!! My biggest fear is heights... so I bought myself a paragliding excursion off of Groupon... and I now have 3 months to use it... I am terrified! lovely post- My husband and I got certified when we lived in the Caribbean- I would never think of diving in Utah!! I'm so not sure that I could go diving, I think I'm too paranoid about things going wrong. What a cool adventure though, the pictures are awesome!! Thank you for your sweet comment on my blog! Boy have I missed you gals! I had such a great time catching up on your blog. You must be one of the bravest women I have come across! Diving scares me so much, and I still haven't tried it. But maybe one day... :) You are such an inspiration!!! And your MS journey was amazing to follow! Your blog fills me with energy and hope! wow....diving fills me full of fear....what an adventure!! The begging of this story made me so claustrophobic but it ends so well. This is awesome. I will never scuba dive I will leave the scuba diving to my husband. I'm really scared of diving, I have a hard time clearing my ears so that worries me! Soooo awesome! I love this and love thre reminder to live boldly! What an awesome experience. I'd love to do it! And so life touching too. This is what I am talking about. The adventures you have been on are crazy cool. These photos are absolutely amazing. I am in awe of you. Seriously. Oh, and if my husband ever tried to get me to jump off a boat into pitch black water, well. Not in this lifetime sister.